Many times the simplest idea is the most difficult to implement, and that's especially true for team communications. Today, we have more options than ever to help us communicate—texts, e-mails, photos, videos, phone calls, instant messaging—and all on the same device. Nevertheless, we often fail to communicate well with colleagues, patients, caregivers, physicians, and others who have a stake in patient care. Poor communication in the health care setting is an important issue, particularly because it can lead to errors and poor patient outcomes. Medication errors, according to a Journal of the American Pharmacists Association report, "are a large burden to the US health care system, causing avoidable hospital admissions and prolonged hospital stays. The majority of these avoidable adverse events are due to the lack of effective communication between health care providers. "1 Poor communication also can lead to duplication of laboratory tests and imaging studies, which increases the cost of care without adding to the value of that care. Ensuring positive and frequent communication is essential because many organizations providing health care to older adults have many moving parts, including primary and specialty care physicians, office-based and home care nurses, pharmacists, community care managers, physical and occupational therapists, and mental health providers. Within the Program of All-Inclusive Care of the Elderly, sometimes referred to as PACE, an important factor in effective communication among the members of the interdisciplinary team is the group's colocation. We've found that having all the players in the same building is extremely important to the success of our communications. Physicians, home care staff, rehabilitation, social workers, day care program staff, clinical pharmacists, and others all work in the same building, which creates multiple opportunities for communication throughout the day. • The interdisciplinary team meets each day to share information about patients. • Care planning meetings offer an opportunity for frequent in-depth discussions that focus on fewer patients. • Multiple informal meetings throughout the day are used to discuss acute but less serious issues. • Mini-team meetings can address specific topics and include only the pertinent disciplines. • E-mail and messaging via the electronic medical record can address less serious issues. Having all the stakeholders in a single building helps to build trust among the team members. As this trust grows, members of the team see each other as valuable resources in caring for patients. Everyone's input is essential for developing a plan of care to meet all the needs of the individual. As each discipline completes assessments and presents the results to the group, a true 360-degree view of the patient emerges. This holistic view of the patient, which includes his or her input as well as input from informal caregivers and family, is critical to success and leads to high patient satisfaction and improved outcomes. Goals of care are defined and understood by the entire team that includes the patient and his or her support system as an important entity. • Clinic: The staff reaches out routinely to the patient and his or her caregiver to provide information about medication changes and potential side effects, test results, and notification of both clinic and outside provider appointments, as well as the results of those appointments. Patients receive a postvisit summary of the physician visit, summarizing the diagnoses, medications, any new orders, and diagnostic tests or changes in their plan of care, as well as instructions on when they should follow up with the physician. • Health information: If a patient resides in a skilled nursing or assisted living facility, for example, written reports of clinic visits are sent directly to the facility. • Social work: Besides frequent visits to a patient's residence, a social worker will occasionally arrange meetings with the patient and his or her caregiver and family members to discuss issues such as a need for a change in residence, a significant change in the patient's care plan, or other concerns the patient, family, or team members may have. The interdisciplinary team is involved in this meeting. Depending on the situation, the team may include a physical and/or occupational therapist, mental health counselor, social worker, clinic nurse, and physician. This ensures everyone knows and understands the patient's care plan and agrees on the plan going forward. While in-person and electronic communications are efficacious in the ongoing care of InnovAge participants, multiple meetings and e-mails have no effect, or at least no positive effect, if there's a lack of trust and respect among the team. Within our program there are staff members of all ages and experiences, so we recognized early on that the only way to realize success was by creating a trusting environment. Supporting this environment is likely the most difficult aspect of communications among the health care team. But to be successful, an organization must create a culture of mutual respect and trust among all team members. — Mary Tuuk, MD, is chief medical officer at InnovAge, a provider of health, wellness, and care management services to older adults in California, Colorado, and New Mexico. She completed a geriatric medicine fellowship at the Denver Veterans Affairs Medical Center and has practiced geriatrics throughout her career. She is a member of the board of the Alzheimer's Association–Colorado Chapter. 1. Johnson A, Guirguis E, Grace Y. 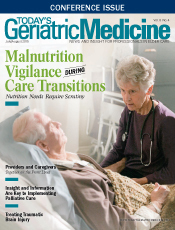 Preventing medication errors in transitions of care: a patient case approach. J Am Pharm Assoc (2003). 2015;55(2):e264-274. 2. National Transitions of Care Coalition. Improving transitions of care with health information technology: position paper of the Health Information Technology Work Group for the National Transitions of Care Coalition. http://www.ntocc.org/portals/0/pdf/resources/hitpaper.pdf. Published December 10, 2010. 3. Mezzich JE, Appleyard J, Ghebrehiwet T. Interdisciplinary collaboration and the construction of person centered medicine. Int J Pers Cent Med. 2014;4(3):149-155.